Using the "Rules and Alerts" option to "run a script", the list of scripts to run is empty. What makes a script appear in the list? The argument must by type MailItem or MeetingItem for the subroutine to be available in the Rules Wizard in Outlook 2007. In Outlook 2010 and 2013 (and up), PostItem also works. You need to avoid processing messages using more than one rule when you are using a run a script rule. Run a script rules should be placed at the top of the rules list and include the "stop processing" action. All actions should be in the script - don't combine actions in the rule with the run a script rule. Include all of the actions you want to take on the items that meet the rule's conditions in the VBA procedure. 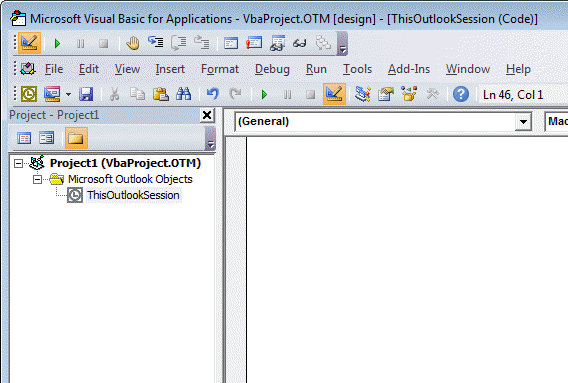 Open Outlook's VBA editor by pressing Alt+F11 and expand Microsoft Office Outlook Objects then double click on ThisOutlookSession. After the script is written, you need to add it to a rule. If you have Outlook 2016 and run a script action is missing, see "Run-a-Script Rules Missing in Outlook" for the fix. Rules > Manage Rules & Alerts. Look on the Tools menu in older versions. Select Apply Rule on messages I receive and click Next. Select your conditions and click Next. Select Run a script action (near the bottom). Select your script, click OK.
Click Next then finish the rule. For best results, all actions should be in the script. I have set up a forward script on a co-workers computer, it worked for about 4 days and then it quit working. when I investigated the script was gone. the next week it did the same thing. I have the exact same script and rule set up on my computer and have never had this issue. The article was really impressive. I followed the steps for running a batch file. However, when I was testing that by sending a mail from myself to me to check if the batch file gets triggered, I see that the batch file is not triggered. I am not sure why it is not triggering the batch file. BTW, if the rule isn't running, you may need to use an ItemAdd macro that watches the folder for new items. I do not have the option to run a script when I go to create new rule. Is there a way to activate this? Yes, you need to set a registry key - it was removed from outlook 2013 and 2016 in in the June security update. See https://www.slipstick.com/outlook/rules/outlook-2016-run-a-script-rules/ for the key and a ready to use reg file. I use itemadd - that will pick up new items as they are added to the folder. See https://www.slipstick.com/developer/itemadd-macro/ for more information. I'm here to bother you on this page because it's the "next step" and I'm having a bit of trouble. When I have finished with a test script, and go through the steps above to create a rule to run it, no scripts show up in the list. What must I do "up front" after the script is tested so that it will show up in that list? if you don't have the Item As Outlook.MailItem in the (), it won't be seen by the rule. if you mean, you can't see the rule action for run a script, see https://www.slipstick.com/outlook/rules/outlook-2016-run-a-script-rules/ - both 2013 and 2016 had run a script disabled by a recent security patch. Thanks again. I had failed to declare the parameter and, without it, that script will not appear in the list of scripts since *something* has to be passed to a script invoked by a rule. Or at least it looks that way because it showed up without issue once I'd corrected that oversight. I have Outlook 2010, but the person I'm assisting has Outlook 2016, and I had already noticed your warning at the top of this page and on at least one other page at slipstick. How i can get E-mail fields as input for external command. I would like to pass subject and msg to below parameters. A. Do we need to keep open outlook client on system always to run the script ? Did you change macro security and restart outlook? add msgbox "Working" after the if.. thens - this will tell you where it is failing. Stepping though the code and watching which lies it skips could be helpful too. I'm assuming that the server path is correct and complete and the slashes were removed by my website software.